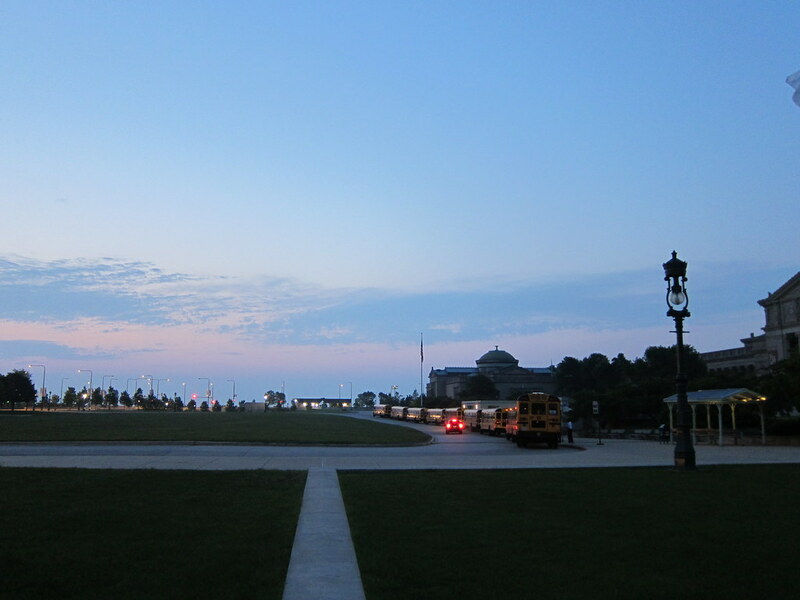 After only an hour's sleep, the Green Girl woke up at 3 am to get ready for 13.1 Chicago. I arrived at the Museum of Science and Technology shortly before 4:30 and parked my car outside the closed parking structure. They opened up the garage and I parked and walked up to the entrance of the museum where yellow school buses were lined up. A runner named Moses from Wisconsin sat next to me on the shuttle and we chatted about the race and the warm weather. I mentioned it was still 78 degrees when I landed at MDW at midnight. When we got to the South Shore Cultural Center, we waited for Jill, a friend of one of the runners from Miles For Smiles, a team dedicated to raising money for the Foundation for Angelman Syndrome Therapeutics (FAST), to get my bib and race packet. 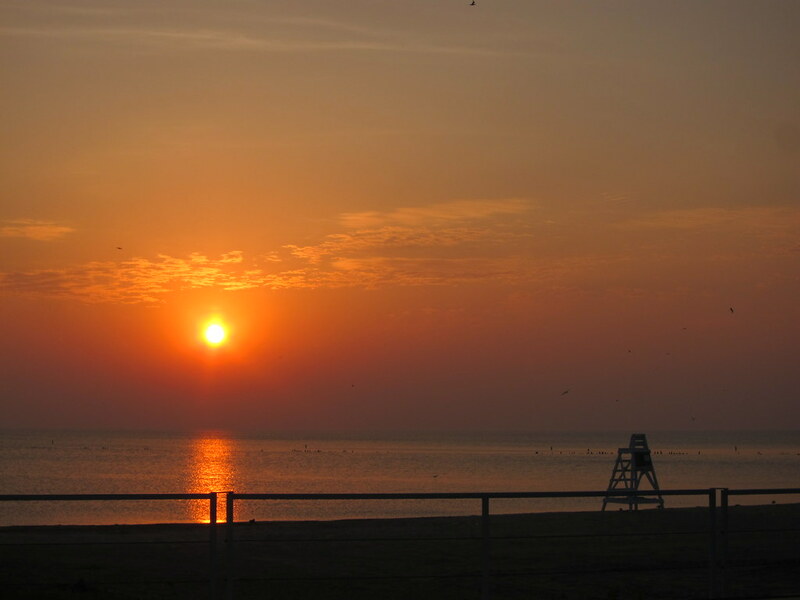 The sun painted the sky with deep hues of red and orange as it rose over Lake Michigan. Jill and Moses went off for warm-up runs while I walked around the cultural center. As I was heading for the last corral of the alphabet, O, I ran into Moses. I wished him luck and told him I hoped the Finish Line would still be there when I got back. He said he hoped to win. 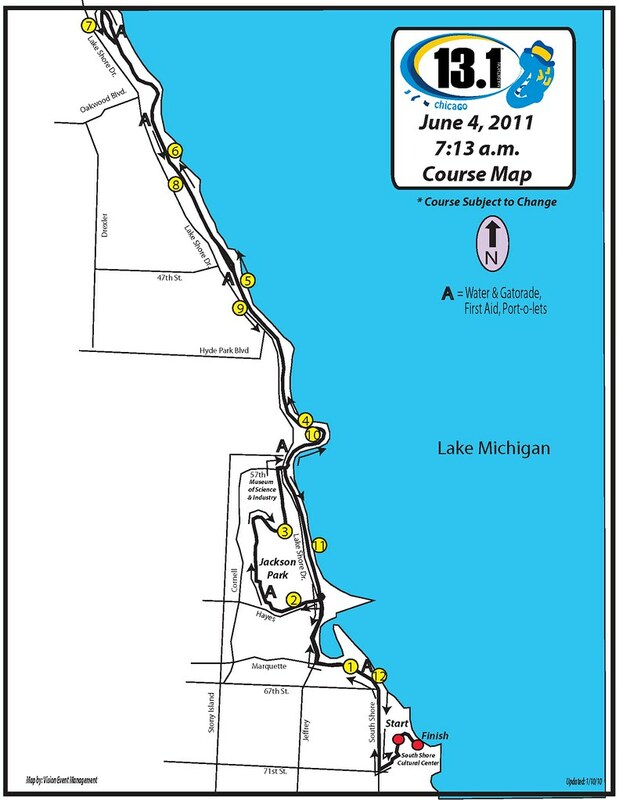 The officials let us know there was a Yellow Flag alert for the race due to the hot weather conditions and mentioned there was a possibility the race could be closed if it got hotter. My strategy to deal with the heat and humidity was to go with 5:1 run/walk intervals, listen to my body, hydrate as much as possible, and take Succeed! S Caps electrolyte capsules. Despite the heat and lack of sleep, my body felt good and I was ready to run. I stopped each mile at the well stocked aid stations. I gulped blue sports drink and poured water over my head. The stretches without shade were almost unbearable but every now and then a welcome breeze would blow through. 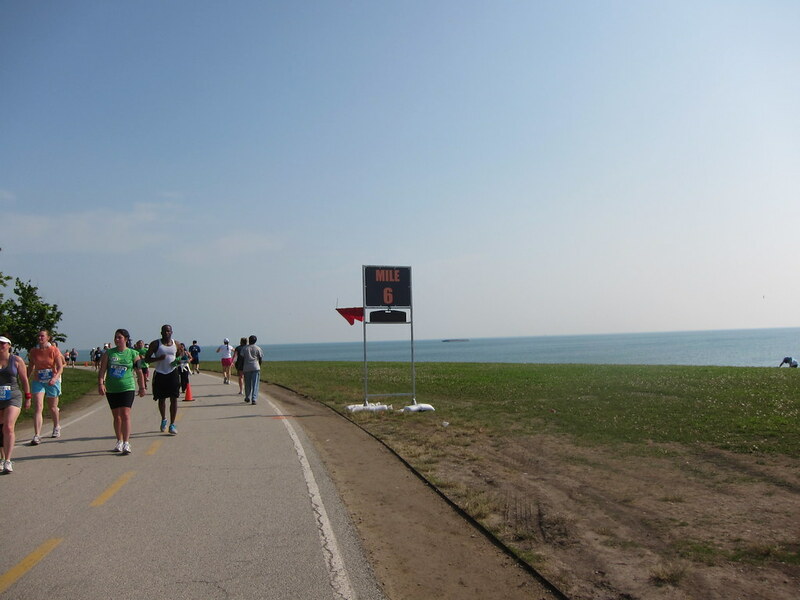 By the time I reached Mile 6, the flag had been elevated to Red and the clock had been disabled. At the halfway point, the timing mat had been removed. Including walk breaks, I was averaging a 14:30 minute mile so I knew I was well under the 16 minute cut-off. 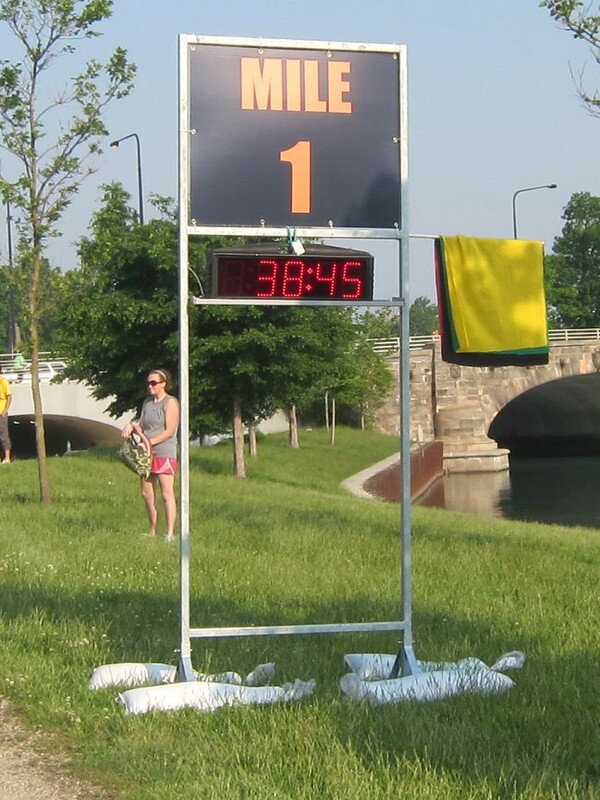 The Mile 7 marker had a Black Flag. I continued running. 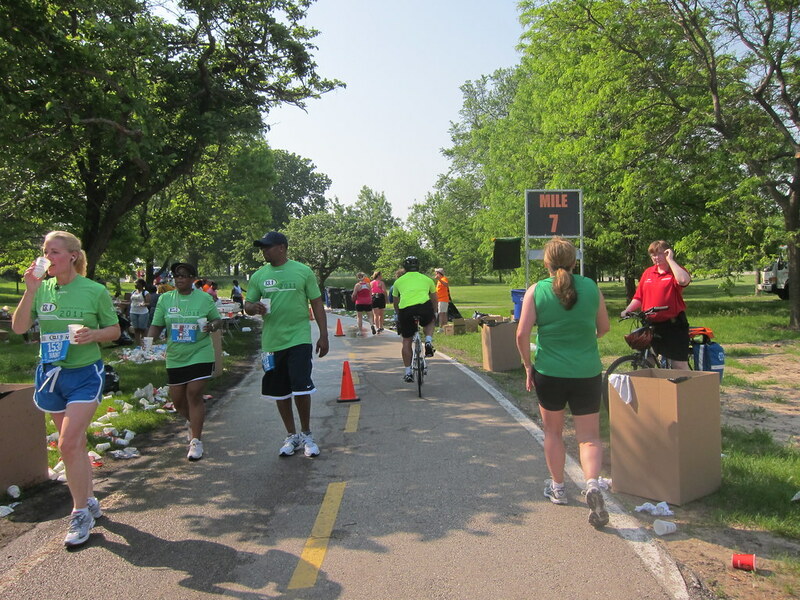 When I was at 7.47 miles, we were stopped in our tracks by race volunteers. 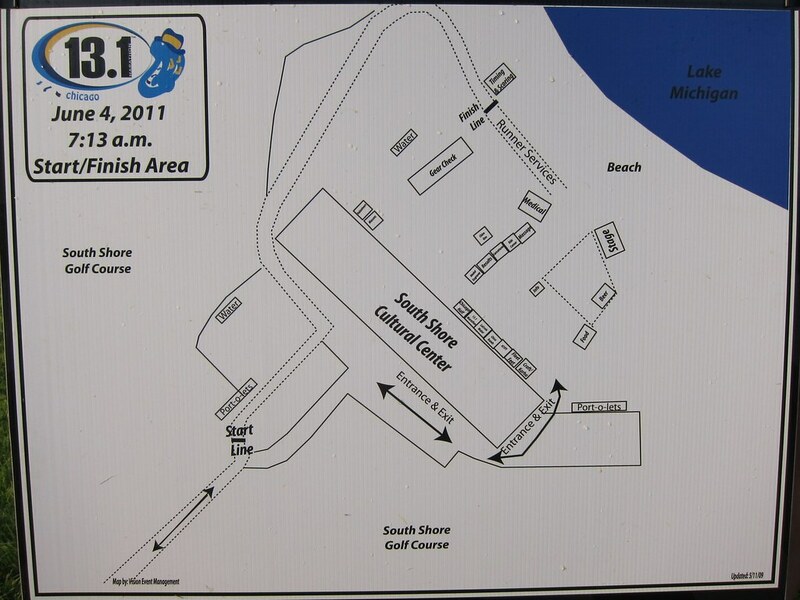 They let us know due to the heat, the race was Black Flagged and officially closed. Disappointed, we all lined up for a shuttle to take us to the Finish Line. 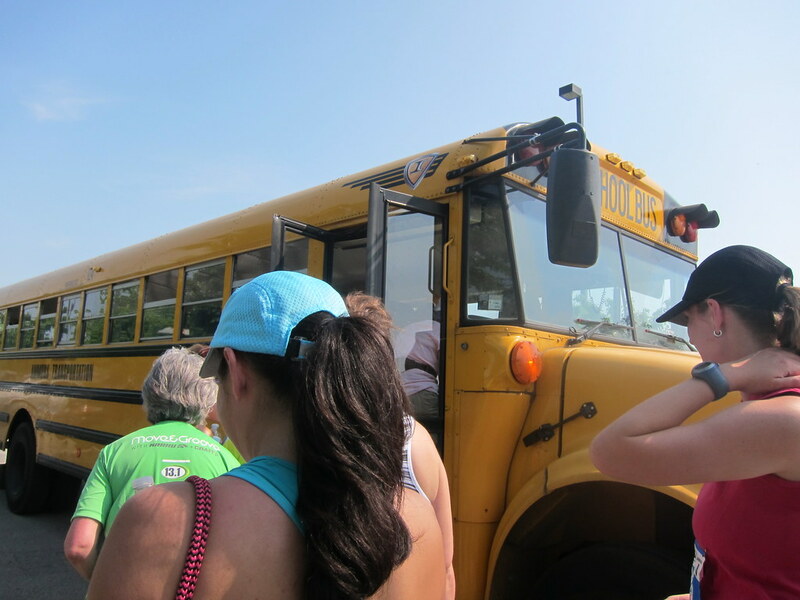 It wasn't until we were on the bus that we heard news of a runner dying. Humbled, we stopped complaining about not being able to finish the race ourselves. At the Finish Line, we all received our not completely earned medals. I saw Moses and I asked him how he did. He told me he won and I high fived him. I asked him how Jill did and he said she placed fourth. I explained how I only went 7.47 miles before the race was closed and told him how a runner had died. 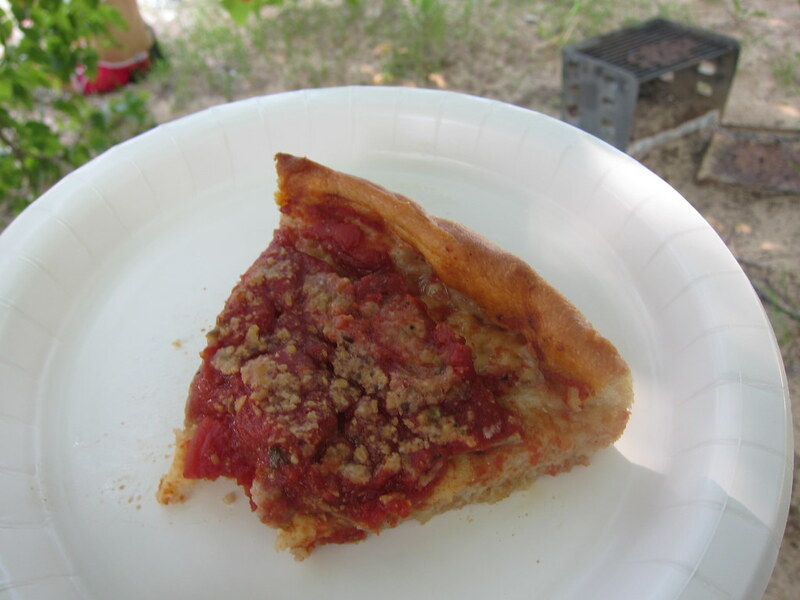 Moses and I grabbed a finisher's slice of Lou Malnati’s pizza and found a shady spot to relax and cool off. I asked him if he got to break the ribbon since he came in first and he said yes. I told him I thought that was the coolest thing ever. After we finished eating, I followed Moses as he went to claim his first place award and prize money. Even though I didn't get to finish my race, I was so proud of Jill and Moses for their outstanding performances! Congratulations on your race! Sounds like you had a great strategy for the heat. R.I.P. to the runner that didn't make it. Tough day for you. Breaks my heart that a runner died. Really. What a sad day. I can't believe you got in so late and up so early. Bravo on what you were able to do. That's hard stuff. Wow... how terribly sad that a runner died and I am sorry you didn't get to finish. It is also very cool though that you got to meet Moses and Jill and that you were doing such a great job in such difficult conditions. My heart goes out to the family of the runner who died. Running in such difficult conditions is certainly a challenge. I am sorry you did not get to finish since it seems you certainly had a good strategy for the race. yikes! How scary for something like that to happen to a runner during a race. Good for you for going that far in the heat and with no sleep!! I thought of you all weekend, especially as I struggled to complete my long run in the heat and was beating myself up about it. I read about the guy who died and my heart goes out to him and all of you. Brings back memories of the 2007 Chicago Marathon inferno. Our weather is so ridiculous sometimes. So sorry it ruined the race for so many. So sorry to hear that a runner died. Very sad. And I'm sorry you didn't get to complete your race. Great job for sticking with it in the terrible conditions. Congratulations and plugging through the heat until you were forced to stop. That must have been totally draining. I heard about the course closing and the runner dying this morning. Always horrible to read about a runner passing away at a race. Such a tragedy. Way to tough it out in brutal conditions. Certainly a unique race report opportunity. Hope the weather is kinder to you next time out. Oh gosh, what a disappointment you traveled all that way and ended up not getting to finish, but better safe than sorry as I'm sure you know. How tragice for the runner, too :(. At first I thought Moses was just joking (I say that sometimes...knowing full well it'll never happen :)) but then saw his award and wow, he DID come in first. Cool!! Congrats on your half, half marathon girl. Hope you get some much-needed sleep! So glad you are okay. Still an amazing experience getting to spend so much time with Moses! It's so sad to hear of "one of our own" dying because of race day conditions. You definitely earned a medal for pushing through in that heat! Oh jeez. It was hot here in MI, but I had no idea it was that bad in Chicago. Awful news. Awful to hear about it happening again in Chicago. Glad you played it safe. That's awesome that you met the winner of the race! That is tough and very sad. In the end it was certainly safer to stop everyone. How cool that you could hang with the race winner! I say you deserve the medal and should keep it special in memory of the runner that died. SO glad you are OK. So sad about the runner who died. What a tough day for so many people, I am sorry you didn't get to finish your race, but like I said, happy that you are safe. Those are such tough conditions, you did great on the miles you did and had a great strategy. That pizza looks fab by the way. Congratulations to you and your friends for braving the heat. It's a true tragedy that someone died. My prayers are with his/her family and friends. Hugs to you. So sad about the runner. So so sad. Glad you made it through as much as possible and that you are ok! I also did the race and found it to be brutally hot. I am glad to see you played it safe. I crossed the finish around 2:40 by my garmin- like an hour slower than normal. No shame in walking or stopping in conditions like that. Very cool you met the winner. I was so sad to hear about the young man passing away. So thankful you raced well and took care of yourself. Heard heartbreaking reports of this race. I am from NE and know too much about heat AND humidity. So tough!! You ran a very smart race in those conditions, kudos to you! So sad for the runner (may he rest in peace) and his family. Sorry to hear, I was so bummed for the dude and you! Way to handle the heat the way you did though, I know you hate it! I hope you got my good vibes out there! just read about the runner passing before seeing this post. very sad to read about this news. glad you are safe. hope you had a fun time in Chi-town regardless. Very sad about the race. 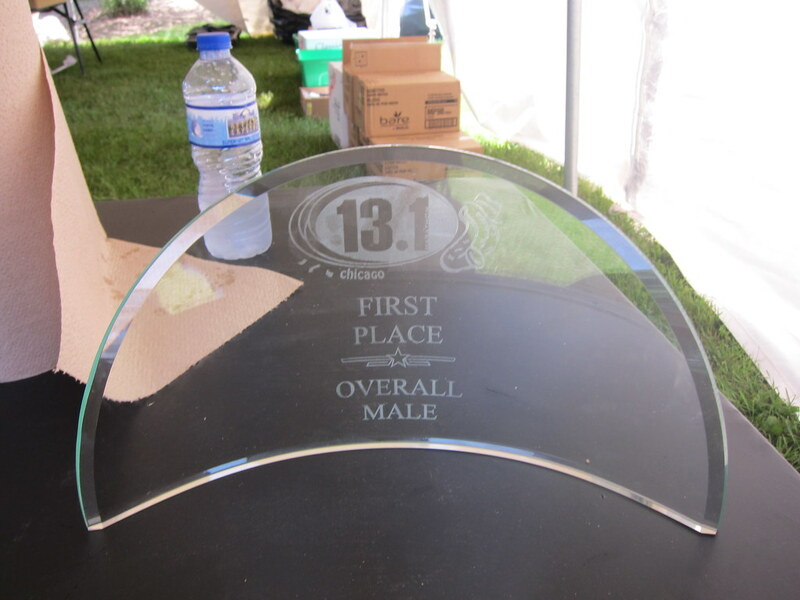 I wish they had Chicago deep dish pizza after every race! It's really sad someone passed away pursuing a passion. The hot weather is always dangerous even for experienced runners. That is so sad about the runner who died. I ran the Boilermaker 15k one year in terrible heat and humidity, and I passed a runner who had collapsed in the heat, and he later died. I've run the race several times since, and I always think of him when I run by that spot. You were still a winner. Congrats. I was supposed to run the race but was injured a few weeks ago doing a 10 mile long run. Since I couldn't run I did the 5k walk. Unfortunately, I was walking towards the finish line when Zachary Gregory collapsed as he waved to his girlfriend. It was horrible. I ran to the finish line to get the medics. I later learned that he didn't make it. They performed chest compressions but he had no pulse. I hope his family finds some consolation. My heart goes out to them, especially his girlfriend who witnessed the whole thing. You should be proud of yourself for what you accomplished. It is so sad about the runner who died.